When trichloroethene (TCE) was detected in a spring offsite from a capped landfill in central Tennessee, the State wanted to drill and sample a deep structure beneath the landfill to find the contaminant. 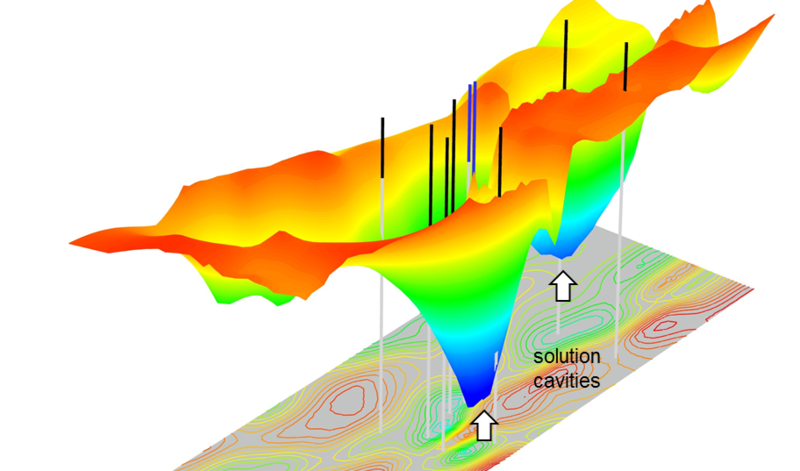 A Zonge induced polarization (IP) survey in an agreed test section provided a 3D map of linear anomalies, interpreted as geologic structures and karst development. Clays within the structures and migrating conductive leachate appeared to “light up” the IP response, providing an indirect map of contaminant migration pathways. Seven boreholes were drilled on and off IP anomalies. 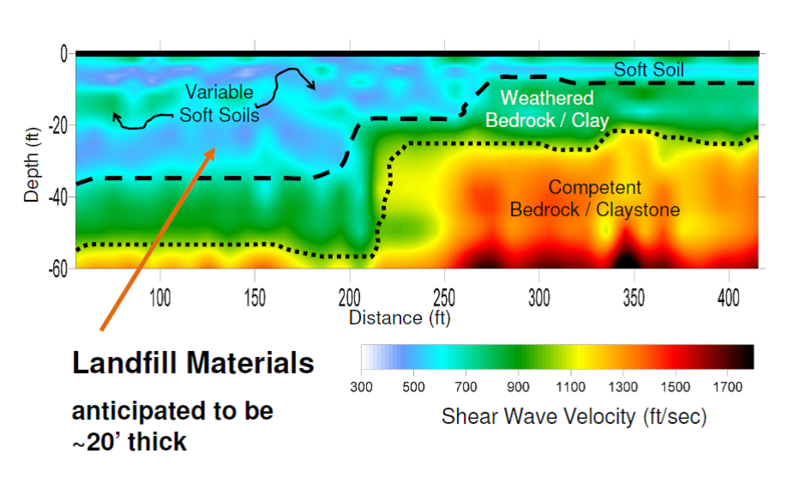 Nominal depths to bedrock (24 to 35 meters) were observed away from the IP-defined structures, but deep bedrock (>99 meters in one case) occurred within pockets of high IP response. These results were used to site two monitoring wells. 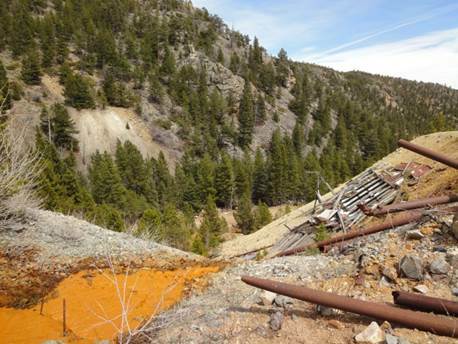 The preliminary results were available in the field, permitting the geophysics team, client, and state regulator to confer and make on-the-spot decisions. This led to the determination that we had tagged the most likely spot for contaminant accumulation and fewer borings and wells were required to test a “worst-case” scenario. Drilling has confirmed the results. 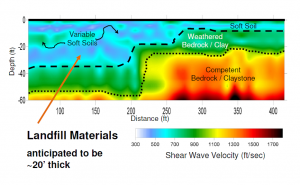 Based on reasonable assumptions, geophysical services have saved $134,000 in drilling costs just within the test area. One of the most common ways to map bedrock is with DC resistivity, especially for the 0 to 10 meter depth range. Induced polarization is less commonly used, in part because DC equipment is simpler to operate than spectral IP instruments. But because polarization is a useful added parameter for interpretation, the slightly higher cost of IP is worth the extra information for many applications. One example is mapping bedrock structure in karst. 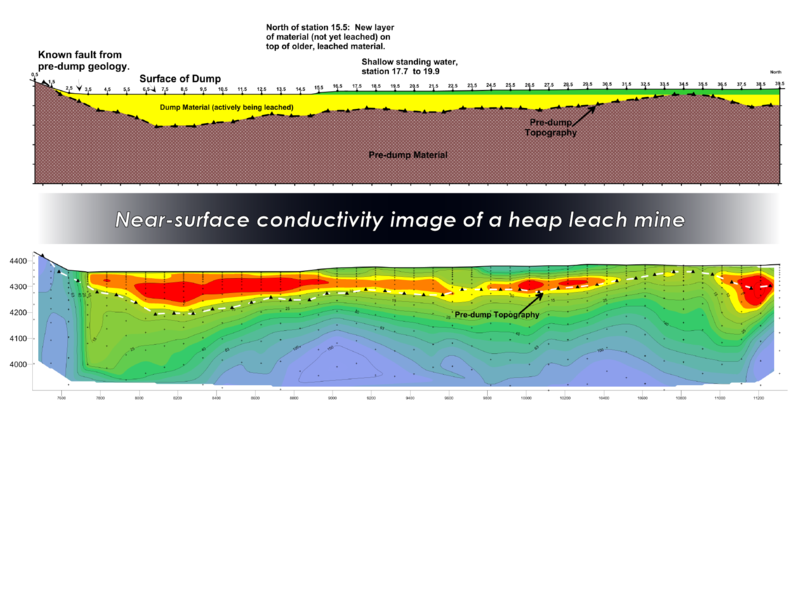 The advantage of IP over resistivity in karst is that features may contain weathered clays, which tend to be polarizable. Polarization helps discriminate between conductors like clays from conductors produced by groundwater and soil-type changes. Acquiring resistivity alone, as is common, would have been insufficient at this site. Left: This buried waste characterization study revealed very unexpected results.